February, March, and April, 1919. Records about Donna’s early vaudeville years are sparse. For example, I know that the January 31,, 1919, issue of Variety, under New Acts mentions, “Donna Montran and Trixie Bressler in a new sketch by Roland West.”[i] We also see an ad for them in the same issue of “Variety.” From that issue of Variety, we have no idea what the show was about, where it played, nor who Trixie Bressler and Roland West are. A month later, things seem confusing because Trixie is back. They are still playing at Keeney’s Newark but only doing four shows. [iv] Was Trixie gone for a couple weeks or was the ad showing Jessie Kennison a mistake. 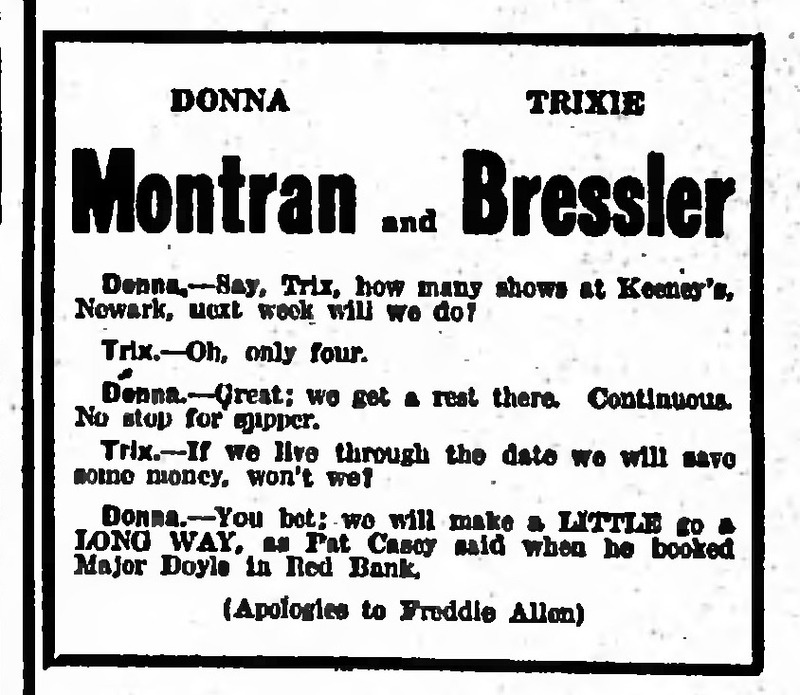 Finally, a week later, on April 21, Variety runs one final ad for Donna Montran and Trixie Bressler that doesn’t have any dates or places for the two. I know very little about Trixie. I do know that she was a young dancer. In May 1918, she presented a dance revue at the Ithaca Star[vii]. Trixie was probably either 19 or 20 years old. Omaha Marriages indicates that Trixie Bressler married George D. Schwartz on 20 Jul 1919. [viii] and that Trixie was 20 when they married. Trixie’s vaudeville career appears to end with her marriage. I have been unsuccessful learning anything about Jessie Kennison. Find Trixie Bressler Schwartz’s descendants and see if they have any memorabilia from Trixie’s vaudeville days. Find advertisements and write-ups about the shows at Keeney’s Newark and Keeney’s Brooklyn and determine if I can learn more about the “Roland West” show with Donna and Trixie. Learn more about Jessie Kennison. [ii] 1919-03-14 – Variety, Motion Pictures, Vaudeville, Theater, Film Industry, Trade Magazine, New York, NY, March 14, 1919. [iii] 1919-03-14 – Variety, Motion Pictures, Vaudeville, Theater, Film Industry, Trade Magazine, New York, NY, 1919, March 14, 1919. [iv] 1919-04-14 – Variety Magazine (New York, NY) Page 75. [viii] Omaha Area Marriages – Schm-Sci – https://omahamarriages.wordpress.com/schm-sci/ – SCHWARTZ, George D.